For recent book reviews, click on the appropriate category. please visit Prairie Fire Review of Books. « Prairie Fire – the spring 2015 issue! Carolyn Gray looks back some 350 years to the French playwright Molière and his play The Miser or L’Avare to find the subject for The Miser of Middlegate, the latest in her series of plays set in Winnipeg. Her version, like the original, places a rich miser at the centre of the story and follows his grotesque and unrelenting pursuit of money and wealth. Unlike the original, The Miser of Middlegate is set in an enclave for the rich in present-day Winnipeg and takes pleasure in sending up the characters’ lusty gay and bisexual appetites. This is not to suggest that Molière is tame in his treatment of sexual desire. His lead character, the miser Harpagon, for instance, competes with his son for the hand in marriage of a young woman still in her teens. In the end the avaricious ways of the characters in both plays are exposed for laughter and ridicule, though they all do get what they want, whether money or love. Gray opens her play in an upscale Winnipeg restaurant on the 37th anniversary of Winchell and Mia’s marriage. The two lovebirds, who are both in their sixties and in retirement, reminisce fondly on their glory days as penniless but ambitious romantics on their way up. “It’s such a marvelous story, like a fairy tale,” says Mia, “how we succeeded” (12). Their version of success as a married couple, we soon learn, has nothing to do with romance and everything to do with the business of getting filthy rich. Winchell recalls how they raised themselves up by being frugal and thrifty. Mia would sew their clothes, and Winchell would borrow from the neighbours. In time they would grow rich on various business ventures, including the ownership of a string of cafés and the patent for bobble-head figures. The celebration of their anniversary, however, turns out to be short-lived. Later that night, Mia declares that she wants a divorce when she learns that Winchell has consulted a lawyer to find out whether he, Winchell, can legally avoid having to share his money with his wife. She is outraged at his miserly ways and finally understands that Winchell will never change, despite his change in fortune: “I get being tight when you’re poor but being tight when you’re rich – ” (16). Mia loves money, but unlike her husband, she loves to spend it, too. Her plan, at least for the interim, is to take up residence in the posh Hotel Fort Garry. Just when Mia and Winchell’s marriage is falling apart, their precocious and ravishingly beautiful 21-year-old daughter Emily is preparing to tell her parents that she’s about to get married. Thus begins the second of three marriage plots in the play. Helping Emily in her designs to marry Martin, an oversexed waiter and part-time surfer dude, is Richard, her father’s new butler. As Emily’s confidant and best friend, Richard plans to smooth the way for Emily’s marriage, which will inevitably be opposed by her parents once they hear of it, and to somehow get the money from her parents to pay for her wedding and Caribbean honeymoon. When Emily, in despair of ever getting her parents to part with their money, says that she should just elope with Martin and “start with nothing,” Richard puts a stop to the idea right away: “You’re waiting for the money, girl. Your father the miser is going to pay” (26). She shouldn’t be satisfied with getting married simply out of love. There’s “shame in being poor,” he says (26). His insistence suggests that he may have a personal stake in the matter. Does he truly want Emily and Martin to be comfortably wedded? Does he want a cut of the wedding money for himself? Or does he want something else altogether? It becomes apparent from the outset that the “effeminate” Richard is not the lowly butler of standard drawing-room theatre. Like the character of Frosine, the “adventuress” in The Miser, Richard is an instigator and matchmaker. He mediates among the various parties, seeking to make himself useful while exploiting the confidence that others place in him. At the same time, he knows more than anyone else, including the audience. It is only gradually, for instance, that we come to realize the extent of Richard’s role in masterminding the events that unfold. On the surface it may appear that he has the best interests of the family in mind: he wants to see Emily and Martin married – at Winchell and Mia’s expense – and he wants to help Winchell save his marriage to Mia. Evidently, he seeks to restore order to the household. However, there is more to Richard’s apparently unselfish goodwill than he lets on. Here the play borrows from the cinematic form of screwball comedy and delights in revising the gender conventions of the form. In the course of the play, Richard assumes the character of the eccentric heroine who captures her unsuspecting man after wacky events ensue. But if Richard is the screwball heroine, who is the object of pursuit? Part of the enjoyment of The Miser of Middlegate is that Richard’s own marriage plot doesn’t fully emerge until late in the play, after much diversion and intrigue. We receive early hints that Richard may be overplaying his hand while arranging Emily’s marriage to Martin. Why is he so particular about Emily’s wedding dress, for example? Why does he call attention to the obvious when he tells Emily that “keeping [her] engagement a secret” must be stressful? What is Richard hiding, if indeed he’s hiding anything? His identity as a gay man isn’t in question to the characters in the play – apart from Winchell, that is, who sees Richard simply as an “effeminate” man blessed with special insight into “male/female unions” (38). Richard’s hidden identity is that of the fiancé who goes to extreme lengths in order to win his man. His elaborate and marvellously ludicrous plan is to insinuate himself into the home of a wealthy family, help marry off the gorgeous daughter to his own fiancé, then substitute himself as the groom at the last minute, get hitched, and escape to the tropics with a pot of money absconded from the miser. A simple plan it must seem to Richard, but to any impartial observer it’s a plan that could go off the rails spectacularly at any point. It very nearly does. Richard finds the love that he’s been seeking, though it comes at a cost. Emily is received back into the family, becoming the dutiful daughter her parents have raised. With this concluding play in her Winnipeg trilogy, Gray continues to deconstruct the subject of class in Canada, among other related subjects. Her first play in the series, The Elmwood Visitation, follows characters from the early 1900s who are driven by ambition to achieve fame and financial gain but at the expense of principle and integrity. In her second play, North Main Gothic, she dramatizes the realities of life facing the poor and the marginalized within the larger social context. In The Miser of Middlegate she focuses more exclusively on an individual family, one that happens to be grossly rich and privileged. Winchell and Mia have cashed in on their business dealings and pride themselves on having done so as a result of heroic individual effort. No one imagines, says Mia, that “we don’t have a care in the world – but they don’t understand that money just doesn’t drop out of the sky” (12). At their core they are greedy people, self-made, believing that they deserve everything they have worked so hard to obtain. In this respect they embrace a brazen entrepreneurial spirit that is celebrated almost uncritically in Canada today, despite the growing divide between the haves and have-nots. The play ends happily, it might seem, for the miser and his family. Emily will enter the family business as a humble barista, but one whose special task will be to spy on the employees. The Winchells are pleased with themselves by the play’s end, but we can see the emptiness and delusion that they are living with. Dale Lakevold is a playwright from Minnedosa, Manitoba. He teaches English & creative writing at Brandon University. Winnipeg: Scirocco Drama, 2014, ISBN 978-1-897289-96-9, 106 pp., $15.95 paper. 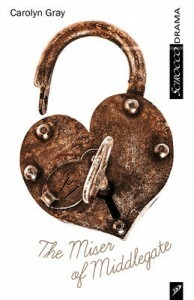 Buy The Miser of Middlegate at McNally Robinson Booksellers. This entry was posted in Book Reviews, Drama. Bookmark the permalink. Both comments and trackbacks are currently closed.